The junior and senior infant classes will be going to University Concert Hall Limerick on Friday the 20th of June to see the new stage adaption of the book ‘What the Ladybird Heard’, with live music and puppetry. It should be a great show! Afterwards they will go to Tons of Fun activity centre. The bus will leave the school at 9:15am and will return at around 2pm. The cost of the tour is € 16 per child. Rang a 1-6 will be going to Delta Adventure Centre where they will get to enjoy a range of group activities including; bungee trampoline, zorb balls, Astro turf pitch, outdoor pirate ship and a range of challenging climbing frames as well as many other fun activities. The trip will take place on the 16th of June and the cost per child will be €12 for Rang 1 agus a 2 and €17 for Rang a 3-6 (this is due to extra activities that the older classes will take part in). The bus will leave from outside the school at 9:15 and return at 2:40. Táimid go léir ag súil le lá iontach! Our annual Sports day has been booked for the 24th of June and details for the day will follow in the next Nuacht Litir. 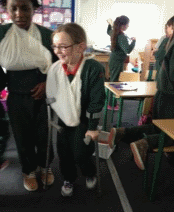 The children in Rang a 3, 4, 5 agus a 6 would like to say a big ‘Go raibh míle maith agat’ to Eavan from the Order of Malta who gave up her afternoon to show the children some basic first aid skills. The children really enjoyed the class and they learned how to treat a number of injuries. 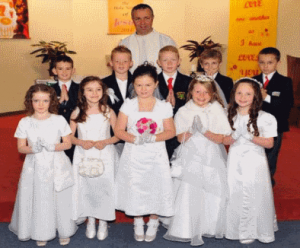 We would also like to say Comhghairdeas to Aoife, Amber, Sophie, Emma, Lucy, Jack, Daithí, Shane, Oisín and Alfie on making their First Holy Communion. We were very proud of all the children who took part in the school choir on Saturday the 10th of May. 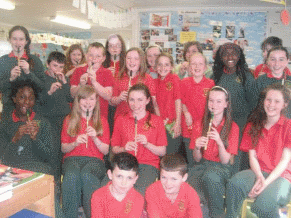 They all sang and played wonderfully and made it a very special day for all of Rang a 2 and their families. 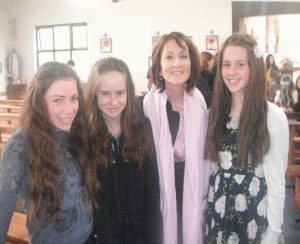 We would like to say ‘Go raibh míle buíochas’ to past pupils; Hilary Orpen who sang with us and Lee de Bhál who played the guitar on the day. 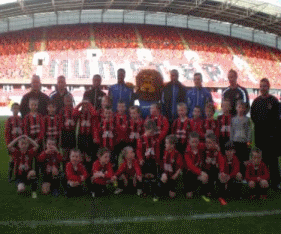 We would like to congratulate all the boys who played in Thomond Park with Shannon Hibs football club on Friday evening. 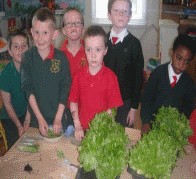 Alfie, Zygge, Cian, Conor, Jack, Daithí , Tiernan and Sasha, we are very proud of you all! They all showed great team spirit on and off the pitch- Maith sibh a bhuachaillí! 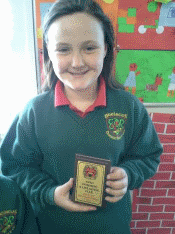 We would encourage parents to let us know of any achievements that the children receive outside of school as we would be delighted to mention them in our Nuacht Litir. Finally, we would like to wish Tony McMahon our Chairperson on the Board of Management the best of luck in the local elections on Friday. Mairead Hackett will be available in the school from 2pm onwards to take orders for new school tracksuits, coats and bags on Friday the 13th and Friday the 20th of June. All school tour money must be paid to class teacher by the 16th of June for Naíonáin and the 6th of June for Rang a 1-6, Go raibh maith agaibh. 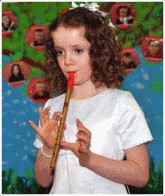 Lá Spóirt will take place on Tuesday the 24th of June, 10-11am (for Naíonáin) and 12:00-2pm for all other classes. This year we will hold the activities in the school yard and the Leisure Centre tennis courts and will have different fun events on as well as novelty races. All parents are welcome to attend, Fáilte roimh na thuismitheoirí go léir! 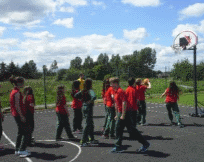 We would like to say Go raibh maith agat to Elton Good for providing the older classes with a free basketball lesson on Thursday. Bhain na páistí an-taitneamh as! 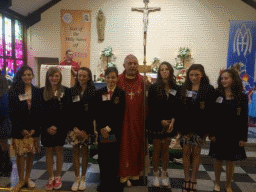 We would like to congratulate Rang a 6 on their Confirmation which took place two weeks ago. The girls and Eoin all looked very smart and put a lot of work into their readings and the music, we were very proud to have such marvelous children representing our school, Maith sibh! All classes are involved in collecting batteries for recycling and all the children have been given a box to fill at home. More details about the initiative can be found on www.erp-recycling.ie. Booklists and information regarding Book rental scheme will be sent home next week. Please check school bags for note. Go raibh maith agat. Rang a 1 had the chance to pick, wash and bag some freshly grown lettuce that they have been growing as part of The Incredible Edibles Programme. We hope you enjoyed eating it at home! 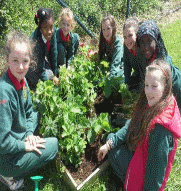 Naíonáin bheaga agus mhóra re-planted our turnips, potatoes, carrots and lettuce in our new raised planting beds, please feel free to come and have a look at all their hard work. 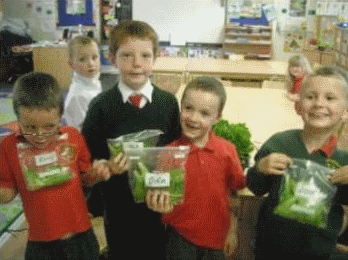 Rang a 3 agus a 5 have been taking great care of our strawberries and black currants and the fruit has begun to grow. Hopefully we will have fresh strawberries to send home before the summer break. Maith sibh, Lean oraibh! We would like to congratulate Claudia Dempsey who wa awarded a trophy for Best Female Swimmer 2014 from The Ennis Swimming and Lifesaving Club Comhghairdeas Claudia!